What are the signs and symptoms endometriosis? The implants may also release substances into the bloodstream which are capable of eliciting pain. Endometriosis can be one of the reasons for infertility for otherwise healthy couples. When laparoscopic examinations are performed during evaluations for infertility, implants are often found in individuals who are totally asymptomatic. The reasons diminished fertility in many patients with endometriosis are not understood. Endometriosis may incite scar tissue formation within the pelvis. 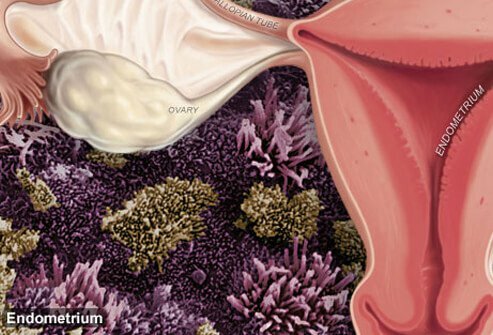 If the ovaries and Fallopian tubes are involved, the mechanical processes involved in the transfer of fertilized eggs into the tubes may be altered. Alternatively, the endometriotic lesions may produce inflammatory substances which adversely affect ovulation, fertilization, and implantation. What about endometriosis and cancer risk? The reasons for the association between endometriosis and ovarian epithelial cancer are not clearly understood. One theory is that the endometriosis implants themselves undergo malignant transformation to cancer. Another possibility is that the presence of endometriosis may be related to other genetic or environmental factors that serve to increase a women’s risk of developing ovarian cancer. Finally, there is evidence that some women with endometriosis have an altered immune response , which may affect the body’s natural ability to recognize ectopic endometrial tissue.